It’s the eve of my college graduation. As of about noon tomorrow, I will be able to count myself as one of the thousands of TCU alumni that proudly bleed purple nationwide. College has been the best four years of my life (so far). For the first time ever, I can genuinely say that I am 100% (and maybe 110% on those really good days) comfortable with me – my strengths, my faults, my anxieties, my hopes, my body image, my self-perception, my everything. It took me a while to get there, but I finally did it – I am finally the best version of me that I have ever been. But there’s still room to grow. Freshman year taught me to step outside of my comfort zone. To take the plunge and try new things. To buckle down and focus – but leave time for other (not-as-important) things as well. To be a support system for newly-met friends (who will later become friends for a lifetime). To stay up until 3 AM talking and making connections – because those connections will get you through the hard times. Sophomore year taught me to keep pushing. To ask for help when life gets to be too dark, too hard. To lean on your friends because they love you and they want to help you. To admit that you’re struggling – and not be ashamed of it. To take all the funny little ironies of life in stride – even when they cut deep to the bone. To take deep breaths and keep moving. To delve into music therapy – and enjoy its ability to take you away. To grow from your struggles rather than let them keep you down. Junior year taught me to enjoy life as it comes. To go out every weekend, because why the hell not? To say “yes” more often. To embrace failure as an inevitable part of the learning process and to move past it to become better. To invest in a good pair of running shoes to clear a troubled mind and rebalance a skewed spirit. To make time for the important things in life – and to understand which things are important and which are not. Senior year taught me to “float on.” To plan for the future, but live in the present (as much as possible). To continue to work hard and be persistent – even when it seems like nothing is paying off. To love wholeheartedly, even if it’s not necessarily reciprocated in the ways I expect. To keep a healthy perspective on life. To give thanks and give back. To build (and rebuild) relationships with wonderful people. To share happiness and gratitude with others. To seek advice and help – and actually take it for once. To buckle down and get better – and keep it that way. I learned a lot of hard life lessons during my four years at TCU, but they have all contributed towards making me the strong, confident individual that I am today. 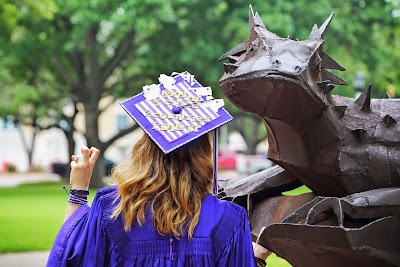 I will walk across that stage with pride in knowing that TCU and all the beautiful souls I have met in my time here have helped me become the best version of myself.